‘Harvest is the process of gathering mature crops from the fields. Reaping is the cutting of grain or pulse for harvest, typically using a scythe, sickle, or reaper. The harvest marks the end of the growing season, or the growing cycle for a particular crop, and social importance of this event makes it the focus of seasonal celebrations such as a harvest festival, found in many religions. On smaller farms with minimal mechanization, harvesting is the most labor-intensive activity of the growing season.’From Wikipedia It always amazes me how eager we are when we find an exciting new venture to capture our attention. One that takes over, in some cases common sense. In looking back at our small family farm beginnings I have to giggle when I remember how grand I thought it all should be, right down to the harvest. 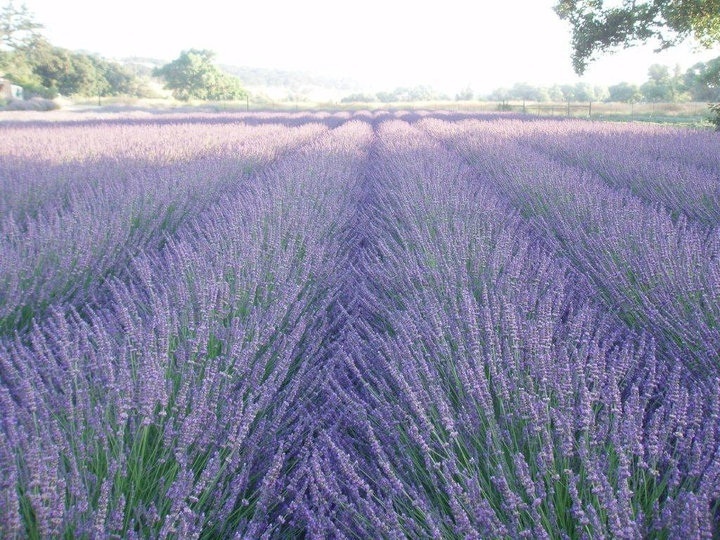 With ideas of tractors and barns and dozens of men, I imagined rows and rows of lavender being hand cut with sickle alone. Kevin harvesting by hand with sickle. It wasn’t until our first mature crop in 2007 that my grandiose dreams awoke with a clear and unmistakable reality! ‘We need to wait until when?’ was the first years question as we decided what we were harvesting for. Culinary, bouquet, sachet and essential oil distillation, these were the things we needed to set our sites on for harvest times and techniques. For us, with our zone and climate, culinary was first harvest crop to look for. 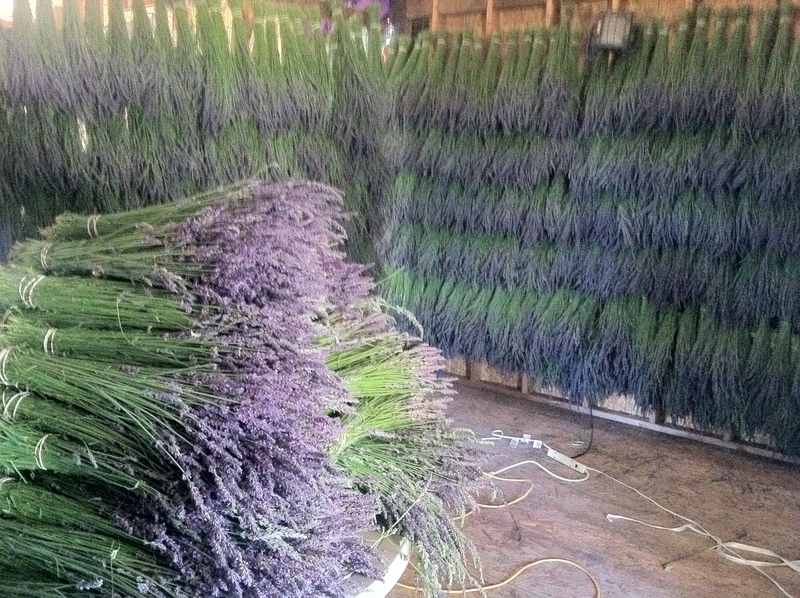 We take the lavender for culinary when the bloom is young and tender, well before the first flower blooms. We have found this makes for a less bitter taste as with any herb. We watched in early May when our Angustifolia’s began to turn silver then to a faint shade of lavender and on into a deep hue of purple. ‘Is it ready?’ was always the question. ‘Do we take it now or wait a day or two?’ That first year I will admit, we took it a bit too early with eager determination to begin our first harvest. Yes it was young and culinary it did not make but oh the oil. 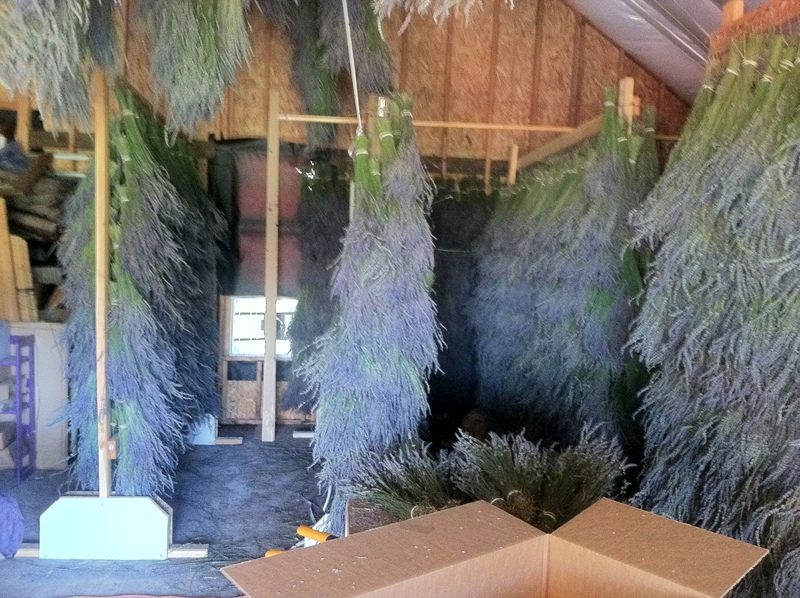 Our first year’s harvest of the Lavender Angustifolia. We were so eager to get going on our harvest! I am with daughter Abigail and our dog. A few more weeks after the several rows we dedicated for culinary turned into an essential oil harvest because they were too young for culinary, the first bloom sprung from the first whirl of the Angustifolia. ‘Ah… this is perfect for the harvest of bouquets!’ With each cultivar giving us approximately a five-week show from first bloom until full bloom, we knew we had somewhat of a timeline depending on Mother Nature and the heat she gave. With sickle in hand we soon learned it was going to take a lot more than a few men, a few separate times per season, hand cutting each plant for culinary and bouquet with all three of our cultivars. Angustifolia’s in May, L x Intermedia’s in June/July. This is still the way we harvest for these two end products. But how can we better the harvest for EO fresh from the field? We needed something less labor intensive, easy on the plant that didn’t leave your lavender lying on the ground. Having heard and tried the infamous ‘Tea Harvester’; it was cumbersome, heavy and required two men just to operate it. Besides the waste along with the brutality of the cut on the lavender plant did not work well. We needed something that wasn’t out there! 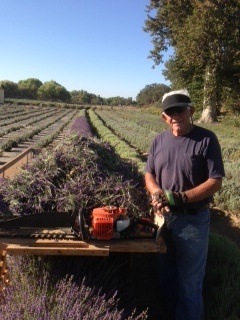 A hedge trimmer was great while cutting and working with the ‘lavender gurney’s’ as we called them, that my Dad made. These are long pieces of fabric with two lateral sides held with a pole much like a regular field gurney. These were handy but not too efficient for harvest from the field to the still. There had to be another way. My dad Don is Professor Gadget because he is continually inventing new gadgets whenever there is a need or an improvement to be made. Dad made a jig of sorts that attaches to the hedge trimmer that works wonders and we still use it today. It makes quick work with just two people and we can get done in one hour what use to take 6 men in two hours! 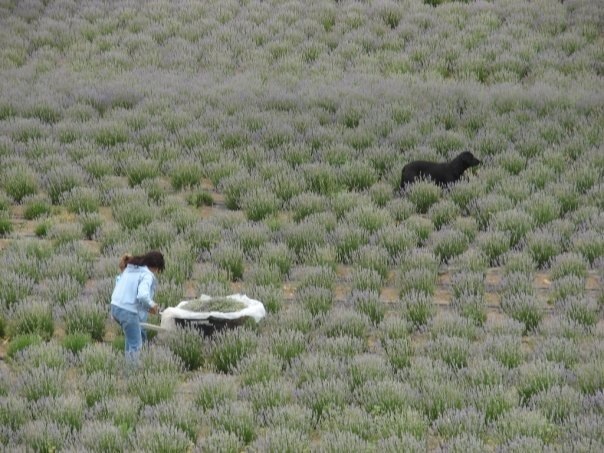 We now always use this technique when harvesting lavender for essential oil fresh from the field to the still. Don Avery aka Professor Gadget. 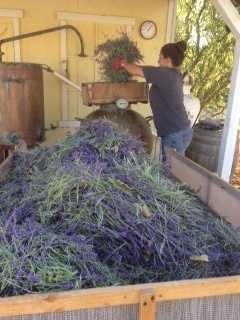 Pictured here is our great Lavender gal Christina loading the freshly harvested lavender from the Harvest Buggy into the 50-gallon Alembic retort. 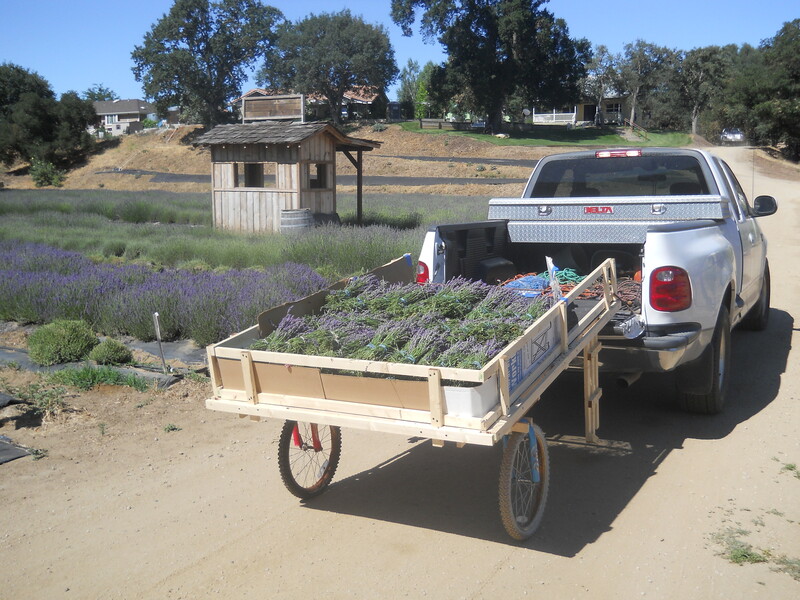 This buggy holds approximately 50 pounds of fresh cut lavender and the entire lot is loaded for distillation. Fast and very efficient. 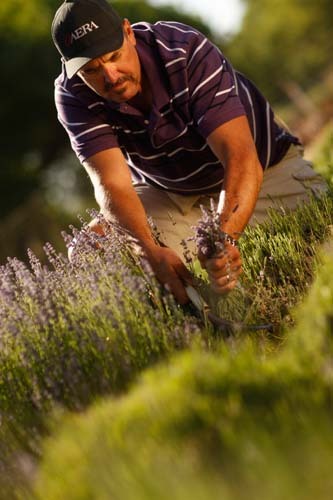 Using the ‘Avery Method’ one man cuts from bottom to top of each lavender plant moving in a semi circular fashion to the top of the plant moving down the rows of lavender until reaching the end. Then he begins the same technique back down the other side of the lavender, pilling the fresh cut heads on top of the plant. 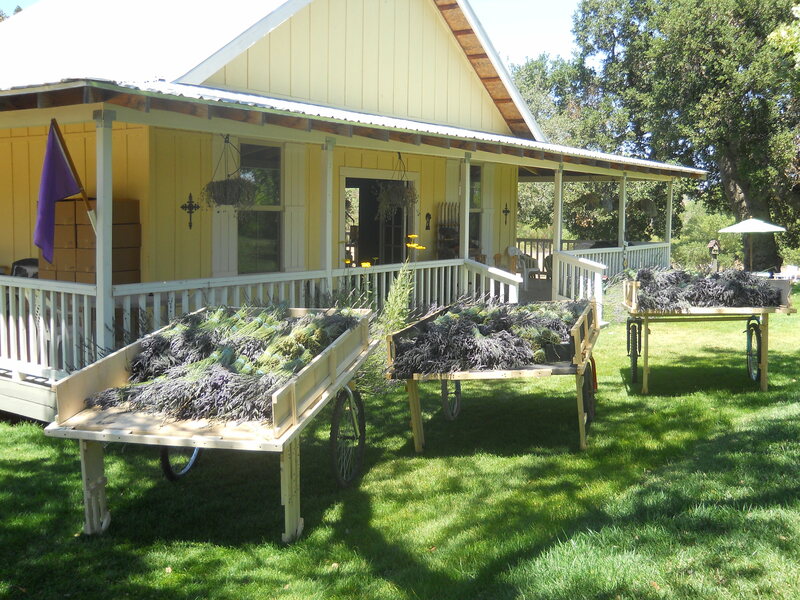 As he or she moves down the row the second person gathers the lavender, which is now in a nice pile on top of the plant and loads it into the ‘Avery Harvest Buggy’. From here the work is made simple, efficient and fast with a crop that is planted out in a hedgerow and even ones that are a bit further apart. Here’s a peek at our second bloom on this years 2 year old Lavender Angustifolia ‘Buena Vista’. The Harvest Buggy is a must when you have limited access to your crop with a tractor or ATV. Again, Professor Gadget came up with this idea using recycled items from the Goodwill. These lightweight frames are invaluable in the field. 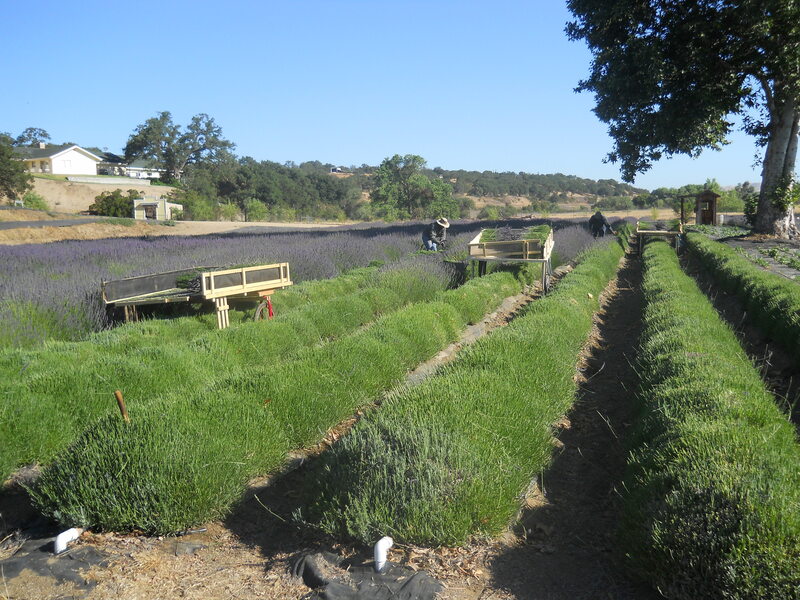 They can be moved with ease over lavender rows even in full bloom as well as be hooked up to the back of your vehicle to transfer product. They even tilt over at a 90-degree angle for quick and easy unloading and storage! Nice one DAD! Hanging the lavender? Ok, we have all tried the rubber band, the paper clip, the wire and the chain, right? But oh how one can make good use out of non-climb fencing or hog wire! Yes, it was our third or fourth year when we discovered this trick. Kevin built wooden frames and attached the wire. He also attached wire to the sidewalls of the barn. He then took and cut one wire out of a grid like pattern and bent that wire towards him. Like magic we had an instant lavender bunch hook! Fast hanging and fast drying this way. A huge time saver! 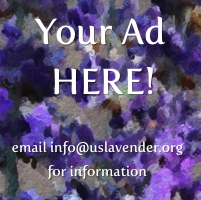 You know telling folks that we are lavender farmers is always a joy. Some may grin with envy and say ‘oh how wonderful and relaxing it must be to work from home around all that lavender!’ and I always agree. But I have to somehow reply back with a smile and sense of gratitude ‘yes it is a rich way of life working from our land remaining sustainable and being able to stay home, but it is still very much FARMING!’ Each morning when I look out my kitchen or bedroom window I feel so blessed to be able to call myself a lavender farmer. Then my mind turns to the chores at hand, ‘shall I return emails, create shippers, do inventory, reconcile the books, make product, fix the irrigation leaks or relax in our lavender field?’ Yes, I truly do feel blessed and lucky most importantly because I get to work with my family! 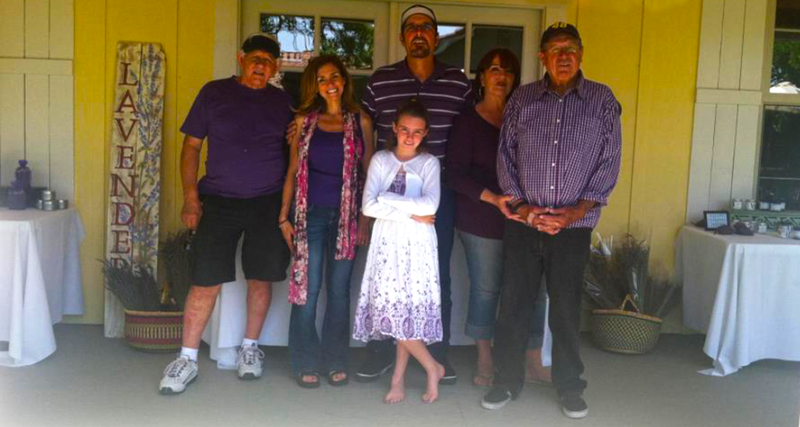 Left to right: Don Avery, Lila Avery Fuson, Kevin Fuson, Mare Fuson, Richard Fuson and in front our dear Abigail. It’s funny, my favorite quote has always been ‘Sometimes you just have to jump off cliffs and build your wings on the way down!’ Author Unknown.